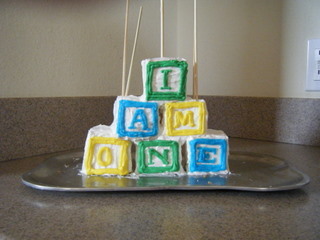 To make this alphabet blocks cake, I used pound cake because I knew it would hold up better to being carved and iced. I cut the cakes into square 2 x 2 blocks (6 of them). I made a thinned buttercream by adding corn syrup to skim coat the outside of the blocks and let them dry, then I added a thicker layer and stacked the blocks. I used wooden skewers to hold then in place until they dried. I piped on the letters using a round tip. then I removed the rods and patched the holes.